The Suitcase Junket is Matt Lorenz: artist, tinkerer, swamp yankee, one-man band. His is the road-worn voice rising over the grind of a tube-amped dumpster guitar, and the wild double pitches of throat singing. 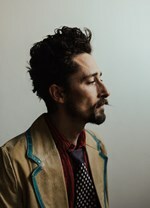 The Suitcase Junket has combined streams of 1.25 million on Spotify and was named to Spotify’s Best of 2016 Folk & Americana and Blues & Roots Rock playlists. Lorenz caught the attention of National Public Radio who chose his video session for "Earth Apple" from his 2015 album Make Time as one of the year's favorite sessions.